This is also known as marine litter. It is litter that has deliberately or accidentally become afloat in a lake, sea, ocean or waterway. It tends to be built up by circular ocean currents and is often washed ashore. The International Oceanographic Commission (IOC) has identified marine debris, as one of the five major marine pollutants. Other major sources are Sewage, Animal Waste, and Fertilizers which can lead to eutrophication; Metals and Organic Contaminants mostly from industrial wastes and Oil Pollution. Driftwood and seaweed wash regularily are washed ashore onto beaches but are not considered to be marine debris which is due to human activity. What types of marine debris are there? What are the sources of marine debris? Where is marine debris found? What is the Environmental impact of marine debris? What can be done about marine debris? What is Australia doing about marine debris? 18,000 pieces of plastic litter are floating on every square kilometre of the world's oceans. Research has shown that eighty percent of marine debris is plastic – a component that has been rapidly accumulating since the end of World War Two. 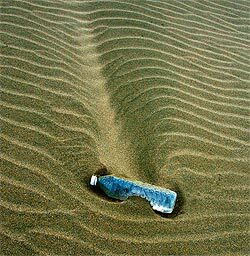 Plastics accumulate because they don't break down naturally (biodegrade) as many other substances do; although they will break down on exposure to sunlight, they do so only under dry conditions. Seven billion tonnes of various types of litter enter the world's oceans every year. Plastics, which generally make up about 60 percent of rubbish, are the worst offenders and can last up to 500 years on the ocean floor before decomposing. Plastics production has grown 500% over the last 30 years. It is still increasing at a rate of 3-5% per year. Marine debris can be classified as degradable or non-degradable. An item usually bgreaks down due to smaller pieces first by the action of waves, wind, etc then is further broken down (biodegraded) by microor-ganisms (e.g. bacteria and fungi). Plastic, glass, synthetic rubber, synthetic fabrics, and metal are typically resistant to biodegradation. some plastics can breakdown when exposed to sunlight in a process called photodegradation. Special thanks to John Vonderlin for allowing us to use his many images of Marine Debris and for his essay below on Plastic bottles. Before I became an obsessive collector, I might have disputed anybody that tried to tell me that plastic bottles are non-buoyant. During many years of collecting them as litter; along lake's and reservoir's shores, from the eddies along river's and creek's edges, or at the coast; either left high and dry by the receding tide, or still rolling in the surf, I never considered them as Sinksam. Probably, because I can't remember ever seeing one resting on the bottom in a shallow water circumstance. If they were in the water, they were floating and consequently seemed like flotsam. My own density about their density, should have been corrected by my memories of fishing around at picnics or big parties, in tubs of icy water, for a water bottle at the bottom. But, it didn't. Maybe, because I'd only resort to that search when the last beer had been removed from the container and my powers of observation or reasoning were appreciably diminished at that point. But, the facts were eventually made clear to me, both by my buoyancy tests, and a simple check of websites dealing with various plastics' creation. The vast majority of disposable plastic bottles, specifically those used for disposable water bottles or soda bottles, are made from PET or polyethylene terephthalate. PET has a specific gravity of 1.38, far higher then fresh or salt water's 1.0 to 1.025. It sinks like a stone, or its sibling rival, the aluminum beverage can. This type of plastic bottle gained favor in the 70's, when "blow-stretch" moulding was invented by the famous painter Andrew Wyeth's son, Nathaniel. By 1991 over eight billion a year were being manufactured in the U.S.. They now constitute about 50% of all soda bottles and even more of water bottles. 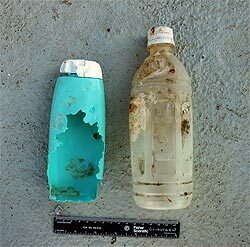 While large numbers of this type of bottle are being recycled these days, (you'll find a #1 recycle code on their bottom) many millions are thoughtlessly thrown away and end up in our watersheds, and thence the ocean. Shamefully, based on where I have frequently found them, launched towards that destination, by people who are enjoying the Great Outdoors, even as they despoil it.